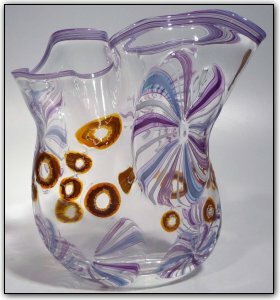 This uniquely shaped and amazingly decorated vase features murrini of a variety of colors over a translucent and purple background. Working with murrini is a three stage time consuming process, first Dirwood hand pulled the canes used to make the murrini after which he cut the canes into the individual murrini pieces, then he used the murrini to make patterns on the glass as he made this vase. Make sure to zoom in to see the true lovliness of this piece, from the beautiful colors to the flowerlike murrini designs, this certainly is a unique and amazing vase!